Loose confederacies often come apart under pressure. There are now divisions forming in the European Union based on whether the countries in that alliance should put larger and larger sums of money into the credit and banking markets and their budgets to help slow the recession, or keep stimulus activities modest and have faith that free market systems will cause the economy to recover on its own without taking the world to Hades in the process. Whether the comments are repudiated by other members of the E.U. now or not, the cat is out of the bag. After behind the scenes conversations about the aggressiveness of the U.S. approach, the views of a number of American allies are now crystal clear  America is spending itself into a hole which it cannot get out of, and the nation is on a course which will eventually lead to socialism. 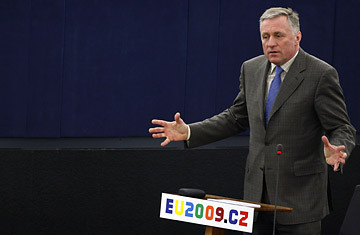 It isn't a big stretch, after those comments, to see that Topolanek may be a Republican Senator disguised as a Czech official. Economists and international financial experts are left to answer an extremely difficult question. Does it matter if other large nations employ similar tactics to the U.S. in reviving their economies? Or, is a coordination of efforts not important to the pace of a global recovery. If Germany refuses to make more than a modest effort to help its banks and major industries while the U.S. is going "all in" with every dime it can spare to help housing, banks, and jobs creation, does the imbalance between the scales of the efforts make a difference? That answer to all of these questions is that it does not matter. The American approach to saving its economy is radical compared to that of almost any other nation and that is not going to change. No other country can marshal the resources that the U.S. government can because of its unprecedented ability to raise money. And, the American presidency and control of both houses of the legislature are held by the same political party. Read the new TIME cover story on how to make America a saner, better place.